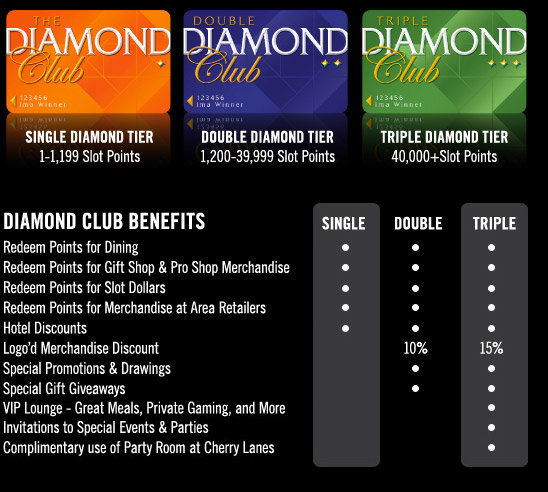 Welcome to a revolutionary new card program where points aren’t just redeemed at the casino, but at the Diamond Jo Casino’s Points Partner businesses. The possibilities are endless! Club qualifying periods are June 1 – November 30 and December 1 – May 31. A rewards program like no other! Your Diamond Club Card is your ALL-ACCESS PASS to shopping in Dubuque. Unlike other players clubs where points can only be redeemed at casinos - the Diamond Club allows you to redeem points both at the casino AND at a number of longstanding, local retailers. Plus you can use your points at all the Diamond Jo Casino's fabulous on-property amenities as well, including Woodfire Grille, The Kitchen Buffet, The Game Sports Bar, Subway, The Filament, and Cherry Lanes.